The Rampal power station (Bengali: রামপাল বিদ্যুৎ কেন্দ্র) is a proposed 1320 megawatt coal-firedpower station at Rampal Upazila of Bagerhat District in Khulna, Bangladesh. It is a joint partnership between India's state owned National Thermal Power Corporation and Bangladesh Power Development Board. The joint venture company is known as Bangladesh India Friendship Power Company (BIFPC). The proposed project, on an area of over 1834 acres of land, is situated 14 kilometres north of the world's largest mangrove forestSundarbans which is a UNESCO world heritage site. It will be the country's largest power plant. In August 2010, a Memorandum of Understanding was signed between Bangladesh Power Development Board (BPDB) and India's state-owned National Thermal Power Corporation (NTPC) where they designated to implement the project by 2016. On 29 January 2012, the Bangladesh Power Development Board signed an agreement with NTPC to build the plant. The joint venture company is known as Bangladesh India Friendship Power Company (BIFPC). The BPDB and the NTPC agreed to implement the project on a 50:50 equity basis. The NTPC will set up and operate the plant. Bangladesh and India will equally share up to 30 per cent of the capital of this project as equity. The remainder of the capital, which might be equivalent to USD 1.5 billion, will be taken as bank loans with help from the NTPC. According to the sources in the Bangladesh Power Division, the joint venture company will enjoy a 15-year tax holiday. This project violates the environmental impact assessment guidelines for coal-based thermal power plants. A 2016 Unesco report called the Environmental Impact Assessment questionable, and called for shelving the project..
On 1 August 2013, Department of Environment (DoE) of Bangladesh approved construction, but then changed its stance and set 50 preconditions for the project. But the location of the plant, 14 kilometres from the Sundarbans, violates one of the basic preconditions which says such projects must be outside a 25-kilometer radius from the outer periphery of an ecologically sensitive area. Environmental activists contend that the proposed location of the Rampal Station would violate provisions of the Ramsar Convention. The Ramsar Convention, to which Bangladesh is a signatory, is an international environmental treaty for the conservation of wetlands. The Sundarbans are on Ramsar's list of wetlands of international importance. The plant will need to import 4.72 million tons of coal per year. This massive freight will need about 59 ships each having 80,000-ton capacity that would be taken to the port on the bank of the Poshur river. The 40 kilometres from the port to the plant cuts through the Sundarbans and it includes the river flow path. Environmentalists say these coal-carrying vehicles are not often covered as they scatter large amounts of fly ash, coal dust and sulphur, and other toxic chemicals are released throughout the life of the project. Carrying large amount of coal through the shallow rivers also pose a threat as five vessels with load of coal, oil and potash sank in the nearby rivers from the time period of December 2014 to January 2017. The plant would draw 219,600 cubic metres of water every day from the Poshur river, and discharge treated waste water back into that river causing pollutants to be introduced into the water supply to the detriment of the mangroves, the marine animals living there and nearby population. The predictions made by environment and ecology experts are that the plant will release toxic gases such as carbon monoxide, oxides of nitrogen and sulphur dioxide, thereby putting the surrounding areas and, most importantly, Sundarban at grave risk. According to a report published in New Age, in past few years the Indian central and state authorities which deal with environmental concerns in India denied the proposal of NTPC to set up a similar coal-fired thermal power plant at Gajmara in Gadarwara of Madhya Pradesh over a number of points. NTPC failed to get approval of the Indian Central Green Panel (Green Tribunal) in 2010 for the construction of that coal-fired thermal power plant because a vast portion of double-crop agricultural land reportedly comprised the site, a similar situation to Rampal. The government of Bangladesh rejects the allegations that the coal-based power plant would adversely affect the world's largest mangrove forest.Tawfiq-e-Elahi Chowdhury, energy adviser of the Bangladeshi prime minister, said that the controversy over the power plant and its impact on the Sundarbans was "not based on facts." She also said that the plant will not negatively affect the mangrove forest because the emission of green house gas will be kept at the minimum level. The government also claimed of importing high quality coal, build a 275-meter high chimney, employing state-of-the art technology and other steps to keep its impact on the Sundarbans at a negligible level. On 1 March 2011, a bench of Bangladesh High Court asked the government "why the construction of the plant should not be declared illegal". Environmental experts have expressed concerns that the proposed plant at Rampal in Bagerhat might destroy the world's largest mangrove forest Sundarbans, a UNESCO world heritage site. Faridul Islam, chief coordinator of Save the Sundarbans, pointed out that the selected location of the project was only nine kilometres from Sundarban. About 2.5 million people depend on the Sundarban region, such as wood-cutters, fishermen, and honey hunters. The National Committee on Protection of Oil, Gas, Mineral Resources, and Power-Port, environmentalist groups, bodies of the left-leaning parties and general people of Bangladesh vowed to resist the planned inauguration of the Rampal Power Plant scheduled on 22 October 2013. On 24 September 2013 thousands of people in Bangladesh began a rally for 5 days and 400 kilometres to oppose the power plant. Their march began in the capital city of Dhaka but slowly went to the world's largest mangrove forest,"Sundarban". As of 30 June 2016, with construction yet to begin, UNESCO had scheduled a meeting for 11 July to decide whether to declare the Sundarbans a "World Heritage Site in Danger," its strongest possible signal to the two governments and to international lenders that the plant should not be built. In India too there has been some fragmented opposition of the power plant. In his interview with Siddharth Sivakumar of the Indian cultural website Tinpahar, Shayan Chowdhury Arnob said on this issue, "The Rampal Power Plant might become the biggest Power Plant, but it would cost the world its largest mangrove forest, the Sundarbans. Sundarbans has its life in numerous intertwined organic chains. When a chain is broken everything would fall apart, one after the other. Money has nothing to do with development or happiness; it's about our attitude to life." In a press conference in New Delhi, India, social and civil society activists from Narmada Bachao Andolan's National Alliance of People's Movements wrote an "open letter" to Indian Prime Minister Narendra Modi on 18 October 2016, appealing to him to withdraw support for the plant saying that it might cause irreparable damage to the Sundarbans in Bangladesh. On 18 January 2017 in the 47th annual meeting of the World Economic Forum (WEF) in Davos of Switzerland, former Vice-President of the United States, Al Gore has urged Prime Minister of Bangladesh, Sheikh Hasina to stop building the coal powered plant close to the largest mangrove forest, Sundarbans. At least 10 activists from various organisations have been admitted to Dhaka Medical College and Hospital, when police used tear gas and rubber bullets to break up the Anti-Rampal protests in the Dhaka University area on 26 January 2017. ^ "Indo-Bangla joint company for power import". The Independent. Dhaka. 8 March 2011. Archived from the original on 10 March 2011. ^ abcd Kumar, Chaitanya (24 September 2013). "Bangladesh Power Plant Struggle Calls for International Solidarity". The Huffington Post. ^ Rahman, Khalilur (24 February 2013). "Demand for Rampal power plant relocation". Financial Express. Dhaka. Archived from the original on 25 February 2013. ^ Ahsan, Manjurul (14 May 2011). "Experts denounce Bagerhat coal-fired power plant plan". New Age. Dhaka. Archived from the original on 2 February 2012. ^ "Final report on environmental impact assessment of 2x (500–660) MW coal based thermal power plant to be constructed at the location of Khulna – India Environment Portal – News, reports, documents, blogs, data, analysis on environment & development – India, South Asia". indiaenvironmentportal.org.in. ^ Ritu, Moshahida Sultana (11 June 2013). "Who gains, who loses?". The Daily Star. ^ "Coal-fired energy BD signs power plant deal with Delhi". pakobserver.net. ^ "Power Division seeks $302m for Rampal plant". The Independent. Dhaka. 8 August 2013. Archived from the original on 2 October 2013. ^ "DoE changes stance on Rampal power plant". The Financial Express. 7 September 2013. ^ "The Roar of Disapproval". Dhaka Courier. 29 September 2013. Retrieved 29 November 2015 – via HighBeam Research. (Subscription required (help)). ^ Anisul Islam Noor (27 October 2015). "Rampal plant won't hamper environ". The New Nation. Retrieved 29 November 2015. ^ "Another Coal Barge Sinks in the Sundarbans World Heritage Site". EcoWatch. Waterkeeper Alliance. 17 January 2017. Retrieved 28 January 2017. ^ Hance, Jeremy (2 March 2016). "Thousands to march against coal plant threat to Bangladesh's Sundarbans forest". The Guardian. ISSN 0261-3077. Retrieved 27 January 2017. ^ "A new power plant could devastate the world's largest mangrove forest". Washington Post. Retrieved 27 January 2017. ^ ab "More reasons to stop Rampal power plant". New Age (Editorial). Dhaka. 26 May 2013. Archived from the original on 4 March 2016. ^ ab Habib, Haroon (27 September 2013). "Bangladesh begins import of power from India". The Hindu. ^ "Govt to lay foundation stone Oct 22". The Daily Star. 26 September 2013. ^ "No coal-run power plant in Bagerhat: BNP". bdnews24.com. 18 June 2011. Archived from the original on 30 October 2012. ^ "US Exim bank urged to refrain from financing". The Daily Star. 29 June 2016. ^ "Siddharth Sivakumar in conversation with Arnob". Tinpahar. ^ "Rampal Power Plant: Protest in India too". The Daily Star. 19 October 2016. Retrieved 27 January 2017. ^ "Stop building Rampal Power Plant so close to Sundarban: Al Gore to Sheikh Hasina | Foreign Relations | ABnews24". abnews24.com/english. Retrieved 28 January 2017. ^ "Anti-Rampal activists announce plans for more protests". bdnews24.com. Retrieved 27 January 2017. The anti-nuclear movement is a social movement that opposes various nuclear technologies. Some direct action groups, environmental movements, and professional organisations have identified themselves with the movement at the local, national, or international level. Major anti-nuclear groups include Campaign for Nuclear Disarmament, Friends of the Earth, Greenpeace, International Physicians for the Prevention of Nuclear War, and the Nuclear Information and Resource Service. The initial objective of the movement was nuclear disarmament, though since the late 1960s opposition has included the use of nuclear power. Many anti-nuclear groups oppose both nuclear power and nuclear weapons. The formation of green parties in the 1970s and 1980s was often a direct result of anti-nuclear politics. For many years after the 1986 Chernobyl disaster nuclear power was off the policy agenda in most countries, and the anti-nuclear power movement seemed to have won its case. Some anti-nuclear groups disbanded. In the 2000s (decade), however, following public relations activities by the nuclear industry,advances in nuclear reactor designs, and concerns about climate change, nuclear power issues came back into energy policy discussions in some countries. The 2011 Japanese nuclear accidents subsequently undermined the nuclear power industry's proposed renaissance and revived nuclear opposition worldwide, putting governments on the defensive. As of 2016, countries such as Australia, Austria, Denmark, Greece, Malaysia, New Zealand, and Norway have no nuclear power stations and remain opposed to nuclear power.Germany, Italy, Spain, Sweden and Switzerland are phasing-out nuclear power. Globally, more nuclear power reactors have closed than opened in recent years. During the era of nuclear weapons testing many local communities were affected, and some are still affected by uranium mining, and radioactive waste disposal. In his book Global Fission: The Battle Over Nuclear Power, Jim Falk explores connections between technological concerns and political concerns. Falk suggests that concerns of citizen groups or individuals who oppose nuclear power have often focused initially on the "range of physical hazards which accompany the technology" and leads to a "concern over the political relations of the nuclear industry" A more neutral observer might observe that this is nothing more than a conspiracy theory. Baruch Fischhoff, a social science professor said that many people really do not trust the nuclear industry.Wade Allison, a physics professor actually says "radiation is safe & all nations should embrace nuclear technology"
Some anti-nuclear groups advocate reduced reliance on reactor-produced medical radioisotopes, through the use of alternative radioisotope production and alternative clinical technologies.Cyclotrons are being increasingly used to produce medical radioisotopes to the point where nuclear reactors are no longer needed to make the most common medical isotopes. In 2014 global wind power capacity expanded 16% to 369,553 MW. Yearly wind energy production is also growing rapidly and has reached around 4% of worldwide electricity usage, 11.4% in the EU, and it is widely used in Asia, and the United States. In 2014, worldwide installed photovoltaics capacity increased to 177 gigawatts (GW), sufficient to supply 1 percent of global electricity demands.Solar thermal energy stations operate in the USA and Spain, and as of 2016, the largest of these is the 392 MW Ivanpah Solar Electric Generating System in California. The world's largest geothermal power installation is The Geysers in California, with a rated capacity of 750 MW. Brazil has one of the largest renewable energy programs in the world, involving production of ethanol fuel from sugar cane, and ethanol now provides 18% of the country's automotive fuel. Ethanol fuel is also widely available in the USA. Anti-nuclear power organisations have emerged in every country that has had a nuclear power programme. Protest movements against nuclear power first emerged in the USA, at the local level, and spread quickly to Europe and the rest of the world. National nuclear campaigns emerged in the late 1970s. 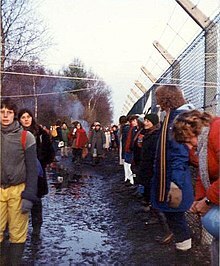 Fuelled by the Three Mile Island accident and the Chernobyl disaster, the anti-nuclear power movement mobilised political and economic forces which for some years "made nuclear energy untenable in many countries". In the 1970s and 1980s, the formation of green parties was often a direct result of anti-nuclear politics (e.g., in Germany and Sweden). Greenpeace International, a non-governmentalenvironmental organization with offices in over 41 countries and headquarters in Amsterdam, Netherlands. International Physicians for the Prevention of Nuclear War, which had affiliates in 41 nations in 1985, representing 135,000 physicians; IPPNW was awarded the UNESCOPeace Education Prize in 1984 and the Nobel Peace Prize in 1985. Parliamentarians for Nuclear Non-Proliferation and Disarmament, a global network of over 700 parliamentarians from more than 75 countries working to prevent nuclear proliferation. Pax Christi International, a Catholic group which took a "sharply anti-nuclear stand". Socialist International, the world body of social democratic parties. Anti nuclear power movement's Smiling Sun logo "Nuclear Power? No Thanks"
Another high-profile anti-nuclear symbol, which is a variation on the international radiation symbol. Anti-nuclear poster from the 1970s American movement. Anti-nuclear demonstration in Colmar, north-eastern France, on October 3, 2009. Protest against ITER in France, 2009. Anti-nuclear protest in 1979 following the Three Mile Island Accident.